We noted in Section 7.5.4 that local extinctions are common events. It follows that conservation biologists need to be aware of the critical importance of recolonization of habitat fragments if fragmented populations are to persist. Thus, we need to pay particular attention to the relationships amongst landscape elements, including dispersal corridors, in relation to the dispersal characteristics of focal species (Fahrig & Merriam, 1994). Westphal et al. (2003) built a stochastic patch occupancy model for the critically endangered southern emu-wren (Stipiturus malachurus intermedins) (based on realistic extinction and recol-onization matrices) and then used a technique known as stochastic dynamic modeling to find optimal solutions for its future management. The metapopulation in the Mount Lofty ranges of South Australia occurs in six remaining patches of dense swamp habitat (Figure 7.28). Emu-wrens are poor flyers and interpatch corridors of appropriate vegetation are likely to be important for metapopulation persistence. The management strategies that Westphal et al. (2003) evaluated were the enlargement of existing patches, linking patches via corridors and creating a new patch (Figure 7.28). The 'cost' of each strategy was standardized to be equivalent to 0.9 ha of revegetated area. The optimization modeling checked among individual management actions, and also compared a variety of management scenario trajectories (e.g. first build a corridor from the largest patch to its neighbor, then, in the next time period, enlarge the largest patch; then create a new patch, etc. ), to find those that reduced the 30-year extinction risk to the greatest extent. Optimal metapopulation management decisions depended on the current state of the population. For example, if only the two smallest patches were occupied, the optimal single action would be to enlarge one of them (patch 2; strategy E2). 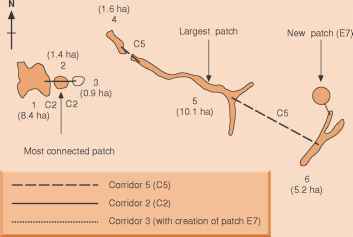 However, when only a more extinction-resistant large patch is occupied, connecting it to neighboring patches is optimal (strategy C5). The best of these fixed strategies reduced the 30-year extinction probabilities by up to 30%. 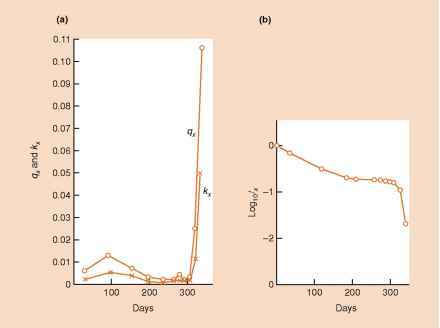 On the other hand, the optimal state-dependent strategies, where chains of different actions were taken over successive time periods, reduced extinction probabilities by 50-80% compared to no-management models. The optimal scenario trajectories varied according to the starting state of the metapopulation and are shown in Figure 7.29. These results hold a number of lessons for conservation managers. First, optimal decisions are highly state dependent, relying on knowledge of patch occupancy and a good understanding of extinction and recolonization rates. Second, the sequence of actions is critical and recognition of an optimal sequence can only be underpinned by an approach such as stochastic dynamic modeling (Clark & Mangel, 2000); it will be hard to come up with simple rules of thumb about metapopulation management. Most important of all is the point that funds available for conservation will always be limited and tools such as these should help achieve the optimal use of scarce resources.